water features that are perfect for you and your backyard. Adding water features to your swimming pool design will add both beauty and excitement to your custom pool. Your choice of water features is nearly endless and is only restricted by your own personal preference and imagination. When deciding what water features you want for your pool you have many options to choose from. Below are some of the most popular water features to add to your pool to choose from including; swimming pool gushers, scuppers, sheer descents, weeping walls, waterfalls, pencil jets, and grottos. If you would like a pool estimate, contact us online or call the office closest to you. We have three locations; Houston, Beaumont and Victoria. You will find the phone numbers of each office location listed at the bottom of the website. Bubblers, sometimes called gushers, are bubbling water features that come up from under the water making a nice bubbling water sound. These water features can be placed in tanning ledges and beach entries were the water depth does not exceed 6”. Any number of bubblers can be added to your pool but rarely are there ever more than three in any give pool. With any water feature you add to your pool, you want to add them in odd numbers. Scuppers are slots or spouts often from a raised ledge or wall from which water flows into your pool. Like other water features, scuppers create a visual enhancement as well as add a soothing backdrop of sound for your pool. Scuppers come in a variety of designs and sizes allowing you to choose the size and design that you like the best. Sheers descent waterfalls produce a clear arc of water, projecting away from a raised wall onto your swimming pool offering a dramatic focal point. The flow of sheer descents can be adjusted to create a wide range of effects. The sounds of sheer descent water features can be almost a silent, glass like sheet of water or a rushing mountain waterfall. Sheer descent waterfalls come in a range of sizes, from one foot up to an eight foot sheer of water. When considering which sheer descent waterfall would be best for your family, please consider the longer the fall of the water the louder the sound. Weeping walls, a type of waterfall, is one of our most popular water features. Weepers are where the water actually comes in-between the rocks and into the pool. Weeping walls are made by having a row of moss rock boulders two to three rocks high, forming a wall around part of your pool. Weeping walls not only look nice but add a beautiful babbling brook sound to your backyard oasis. 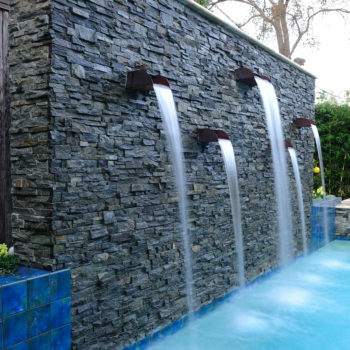 Natural rock waterfalls are very common in backyard pool designs. The sounds of flowing water cascading down a natural rock waterfall will transform any swimming pool into a backyard oasis. If you prefer the cascading effect of water dropping from one rock to the next, this has a louder sound than water flowing over the rocks like a babbling brook. Accessorizing your pool with a waterfall truly adds a natural look and feel to your swimming pool. This water feature is a bit unique. Its thin strong water flow creates a “WOW Factor” when your family and guests see it. Pencil jets shoot streams of water from you pool deck into your pool. It’s a dramatic feature and looks beautiful with a geometric pool. Swimming pool grottos are one of the ultimate water features to add to a swimming pool. Imagine sitting underneath a natural rock grotto with water cascading in front of you. Platinum Pools builds each and every grotto from natural stone. We never use fake stones because we feel our customers deserve a quality product. A natural rock grotto will have a large natural stone with a bench under it. The size of the grottos range from a 3 tons which is for one person to sit underneath to 5 tons which allows for two people to sit underneath.